This guide describes yearbooks and student-produced newspapers that are available in the University of Iowa Archives, Department of Special Collections. RG numbers refer to the described collection’s record group number. If you have questions about our holdings, please feel free to contact us. Hawkeye yearbook. 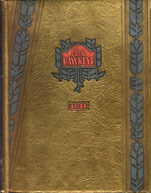 The Hawkeye, the University of Iowa’s student yearbook, was published from 1892 until 1992 with an interruption during the 1970’s. Indexes to photographs of individuals (faculty, students, staff and alumni) and to groups, buildings and other scenes for the 1893-1942 editions are available online. 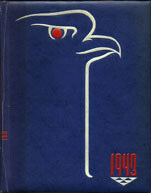 Until 1946, the Hawkeye was an annual project of the junior class. Its title by year reflects that class’s year of graduation, rather than the academic year. For example, the 1939 Hawkeye documents events and activities of the 1937-38 academic year, rather than 1938-39. Beginning in 1946 and for most of its remaining life, the Hawkeye was produced by Student Publications, Inc., publisher of The Daily Iowan. 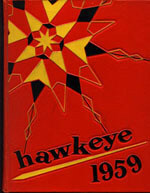 To “correct” the title-year confusion, two editions of the Hawkeye bear the year 1946: Volume 55, chronicling the 1944-45 school year, and Volume 56, covering 1945-46. 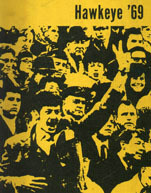 From 1973 to 1977, the Hawkeye suspended publication due to waning interest. It ceased publication in 1992 due to a lack of funds. Circulating copies of the Hawkeye are available in the Main Library (folio LD2577 .H32) and a non-circulating set is maintained by the University Archives. An early history of the Hawkeye is available in the Archives: Sheppard, Norma L. History of The Hawkeye. Iowa City, 1942. Freshman Record (alternate titles: New Student Record; Freshperson Record; Who’s New at the U). The Record was published by the Liberal Arts Student Association. Each edition features portrait photographs of incoming students, as well as campus scenes. The Archives has editions published from Fall 1973 to Fall 1982, inclusive, which document the projected graduating classes of 1977 to 1986, respectively. To avoid confusion, note that several editions of the Freshman Record et. al. are named for the year of class graduation rather than for the year of publication. University of Iowa Yearbook. For a brief period during the 1970’s while the Hawkeye was on hiatus , Delma Studios, a commercial publisher, produced and distributed yearbooks featuring campus scenes and portrait photographs of graduating seniors. The Archives has two editions: 1974 and 1976. Quadrangler. Published by and for the residents of Quadrangle men’s residence hall, the Archives has editions dated 1927 to 1931. The above four titles comprise collection RG 02.0010.001 in the Archives. Class and Faculty Photograph Album Collection. Prior to the Hawkeye, from 1878 until about 1895, commercial photographers in Iowa City produced photograph albums featuring students and faculty. The albums were among the earliest attempts to document University of Iowa campus life (RG 30.0001.020). The Daily Iowan. The Daily Iowan began publishing under this name on September 21, 1901. It was preceded by four other student-produced newspapers: the University Reporter (1868-81), the Vidette (1879-81), the Vidette-Reporter (1881-1901), and the University Mirror (1888). Back issues of the Daily Iowan and its predecessor publications are available online as part of the Iowa Digital Library. This digital collection spans 1868 to the current year and is searchable by date. Back issues of the Daily Iowan are also available on microfilm in Media Services of the Main Library. In addition, the Archives maintains bound volumes of all five titles; issues may be researched by date of publication. A portion of the Archives’ set of the Daily Iowan is closed for research due to its fragile condition. A card index of the University Reporter and the Vidette-Reporter is maintained by the Archives; limited indexing of the Daily Iowan is available at the Iowa City Public Library. Both indexes are searchable by name and subject. University Reporter: v. I – XIII (1868/69 – 1880/81 school years). The University Reporter published 13 volumes before it merged with the Vidette in Fall 1881. Vidette: v. I – II (1879/80 – 1880/81 school years). Vidette-Reporter: v. XIV – XXXIII (1881/82 – 1900/01 school years). University Mirror: v. I no. 1-12 (September-December 1888). The Daily Iowan: v. XXXIV – present (1901/02 – ). Missing issues: 1918/19 school year and Summer 1984.